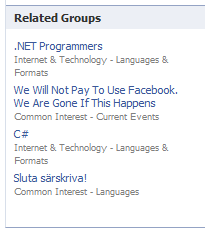 The other day when I visited a group page on Facebook and looked at the "Related groups" section I started to think about how that SQL question might be implemented. Screen capture from the MSDN Sweden Facebook group. This is not a list that the group owner can control, instead the list automatically shows groups that has a lot of members in common with the group you're currently visiting. To have some test data I filled these tables with the following data. As you can see the "Comic Book Characters" and the "Superheroes" groups have a lot of members in common while the "Celebrities" group is an island. So, based on a given GroupId, how can we get a resultset that lists all of the other groups with a column that specifies the amount of shared members? Let's build this step by step, in fact I do this as I'm writing so the final solution is not totally clear to me yet, even though I have some idea. If you want to follow along and run these SQL commands you can download the database file here (this database also includes the final SQL command as a stored procedure). Now we need to filter the inner select so that it only counts the members that are also members in the given group (GroupId=2). And really, this was no brain surgery. We simply say that the PersonId of the rows we count has to have a value that corresponds to any PersonId that is a member of group 2 by using the IN statement and yet another nested SELECT statement. Of course you wouldn't want to display the "Celebrities" group in this case, since it has no members in common with the "Superheroes" group. 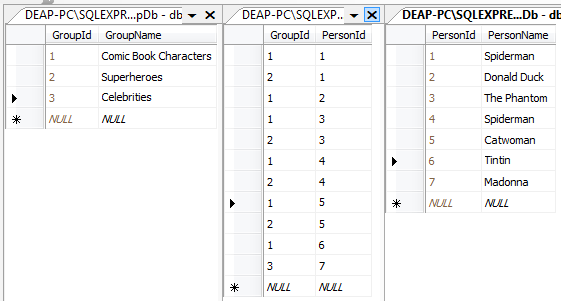 How could you filter the resultset so that it only includes groups where SharedMemberCount is more than zero? You might wanna use this technique.